Located on the international airport of Athens (in the central zone, just 50 meters away from the arrival and departure halls), Sofitel offers a beautiful and relaxing accommodation experience. 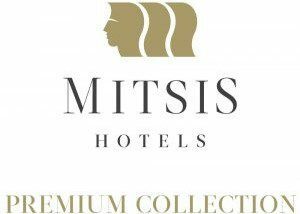 Sofitel Athens Airport, a member of Mitsis Premium Collection, offers a perfect stay in a city airport hotel in Europe, being the only 5-star hotel in the greater Mesoghia region. 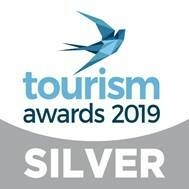 Here, everything has been prepared to let international travellers know that they are in the right place- whether they will be spending a few days in Greece to discover the country for the first time, or flying out the next day to other destinations. Conveniently located just a few steps from Athens International Airport, the hotel offers the best of ancient traditions revived and presented with a combined touch of elegance, refined luxury, Mediterranean warmth and the imagination of contemporary designers. Sofitel Athens Airport provides an excellent choice of accommodation facilities according to your needs. 345 luxury rooms of the hotel are equipped with the latest technology, carefully concealed behind functional pieces of furniture allowing the guests infinite facilities. The suites of the 7th and 8th floor, including the supreme Presidential Suite in #805, are designed for comfort in unpretentious luxury. All the suites feature a hall, dining room and small lounge with comfortable sofas and arm chairs in soft, earth-coloured fabrics. The lounge is separated from the spacious bedroom by a twin panel, sliding door that provides complete acoustic and visual privacy. The suites of the 8th floor, including the supreme Presidential Suite in #805, are designed for comfort in unpretentious luxury. All the suites feature a hall, dining room and small lounge with comfortable sofas and armchairs in soft, earth-colored fabrics. The lounge is separated from the spacious bedroom by a twin panel, sliding door that provides complete acoustic and visual privacy. The suites of the 7th and 8th floor, including the supreme Presidential Suite in #805, are designed for comfort in unpretentious luxury. All the suites feature a hall, dining room and small lounge with comfortable sofas and arm chairs in soft, earth-colored fabrics. The lounge is separated from the spacious bedroom by a twin panel, sliding door that provides complete acoustic and visual privacy. 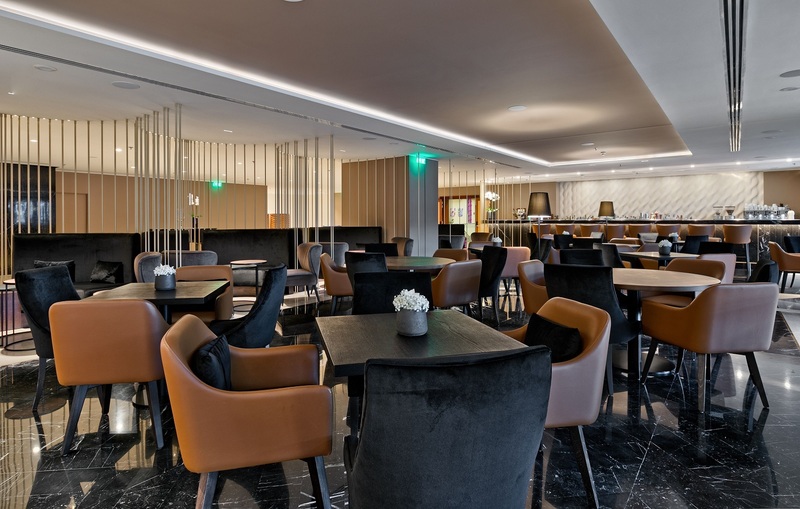 Enjoy a delicious gastronomic experience in the restaurants of Sofitel Athens Airport, as all of our outlets offer you international tastes and excellent views, before taking off or after. The all-day dining restaurant for the eclectic traveler, seeking taste, originality and aesthetics, where guests can enjoy their breakfast, lunch and dinner. 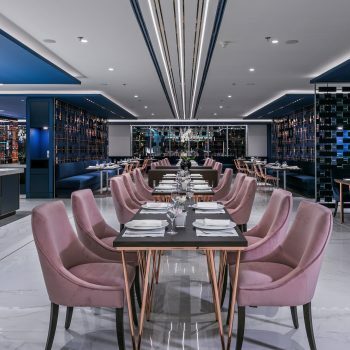 The completely renovated Mesoghaia restaurant will surprise you with its modern design: rose gold details, oxford blue finishes and white marble surfaces give it a distinct style. 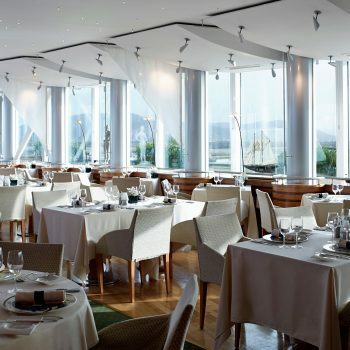 Fine dining roof top restaurant with a magnificent view over the Athens International Airport and the valley of Mesoghia. Bar open from 17:30 to 01:00. Enjoy your stay with the superb services of Sofitel Athens Airport! 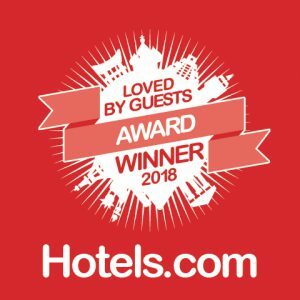 Guests here have the assurance of friendly and highly professional staff combined with the advantage of all the latest business and entertainment systems, in rooms and throughout the hotel. Organize a successful meeting or a flawless event at the venues of Sofitel Athens Airport! If you are on business trip, we can provide ideal accommodation, equipped meeting and conference rooms, as well as excellent facilities for your business lunches. Ten conference rooms with a capacity of up to 600 people and a competently equipped business centre are ready to offer any services, satisfying even the most discerning business traveller. Sirius A unique 96m² hall, located on the ground floor, with natural lighting and seating for up to 15 people. Its layout is reminiscent of the board meeting rooms of large corporations with a solid mahogany table and executive leather chairs. Orion Functional 70 m² hall on the ground floor, with a capacity of up to 40 people for conference. Cassiopeia 40 m² room with a capacity of 22 persons for conferences. Vega With a capacity of 50 people for conference and 60 people for events. Pollux Interview room 20 m². Selini Next to Callisto are the small Selini 1, 2 & 3, conference halls of 20m² each that can be customized to suit various conference requirements. Callisto The largest hall of the Conference Centre is the 600m² situated on the lower ground floor. This great hall features natural lighting and its own separate access from the hotel. Fully equipped with all the latest audiovisual systems, it may hold up to 600 participants. The facilities of Sofitel Athens Airport make your stay in Athens relaxing and carefree. Indoor swimming pool, located on the 9th floor of the hotel, with a view over the Athens International Airport. A fitness centre with sauna, located on the 9th floor of the hotel. Welcome to a world of relaxation and rejuvenation: the spa and fitness facilities of Sofitel Athens Airport. Sofitel is best place to stay. On main floor they have remodelled the restaurant and it is very contemporary and beautiful. Service is excellent, food is great, beds are comfy and you can check into your flight right from the hotel. Fantastic! This Hotel is a total tonic for the footsore traveller. We could check in without fuss, enjoy a drink at the Bar and then unwind in total comfort in our sizeable room. A super-sized bottle of mineral water and handmade chocolates completed the circle of comfort. All the staff treated us so well here that we felt completely at home. Just got back from Sofitel Athens airport. The hotel was right in the airport! 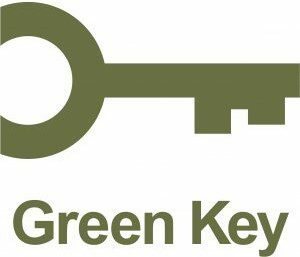 Check in was seamless and the staff was very helpful and polite. Our rooms were clean and well equipped. The only problem was that we only stayed for one night! Extremely comfortable hotel and a great location to the airport. Delicious food. Hotel also offers a pool and spa. Very clean and the bed was so comfortable!! Just so handy but so much more. We had time to visit the major attractions in Athens! The pool on the 9th floor was refreshing, with great facilities. Great buffet breakkie. Friendly staff speaking English. Would stay here in a heartbeat. The people of Sofitel Athens Airport are always at your disposal.